Thanksgiving Powerpoint Game: "Turkey Trot"
Tired of Jeopardy? 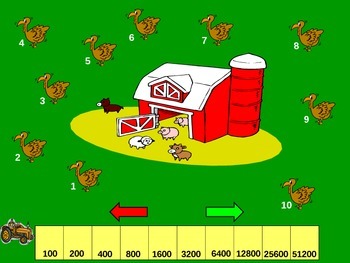 This is a fun and interactive Thanksgiving themed PPT game that can be used for any grade and any subject. Simply add your questions and answers in the slides and press F5 to play the game. This game must be play as one class against another class (not teams within one class) since there is only one tractor. Choose a turkey to go to a question. Click to reveal the answer. Then click the icon at the bottom right to go back to the main screen. If the person you call on has the right answer, click on the green arrow and watch the tractor advance. If they choose to skip, the tractor stays put. If they choose to answer and it's wrong, press the red arrow and watch the tractor start all over. Lots of fun!